I hated my oily skin when I was growing up. I was never able to fully get the shine under control. I was (and still am) religious about washing my face in the morning and before bed. What was really annoying, though, was an hour after applying powder, it would be melted off and my face back to its regular greasy state. I cursed it back then and hated my skin. I’m older now and I still have oily skin though its gotten slightly better since my teen years. I still have major issues though with my face becoming greasy and I deal with breakouts only around my monthly cycle now (vs. every single day!). I know oily skin helps slow the aging process and that’s a huge plus for me as I edge closer and closer to the big 4-0. I’ve recently discovered some fantastic products that seem like they were made just for me! Cetaphil DERMACONTROL Oil Control Foam Wash and Oil Control Moisturizer SPF 30. I liked that it was specifically designed for oily, combination or blemish-prone skin. That’s me…oily and blemish-prone yay. I was curious to see if it would really work to control the oil and if it would be gentle enough on my easily irritated skin. The Oil Control Foam Wash contains a zinc complex that absorbs excess oil as well as soothing, cleansing and hydrating your skin. The soap-free foam has a light pleasant scent that lathers up nicely. It feels really light and I also like that there’s no need to scrub. There was no redness or irritation or stinging or burning. It’s a very gentle cleanser and I found it worked wonders at reducing the oil. Sometimes products that reduce oil are also very drying on your skin. Yes, oily skin can get dry patches! I didn’t find this product at all drying. I always thought that I didn’t need moisturizer since I had enough of it already, but I learned that daily moisturizing can help keep skin healthier. The Moisturizer SPF 30 also protects my skin from the sun’s powerful rays. It’s a 3-in-1 formula that does three things: hydrates, protects and controls shine. The Ceramide technology replenishes the skin’s moisture barrier while the Oleosome technology provides SPF 30 with minimized irritation potential. I was surprised that it didn’t make my skin oily! Instead my skin was smooth with a soft matte finish and protected from the sun! I never liked wearing sunscreen on my face before so at least now I’m protected when I go outside. I can see now why Cetaphil DERMACONTROL was voted Canada’s 2013 Product of the Year in the Facial Care Category and is recommended by the Dermatology Review Panel. If you or your teen have oily or blemish-prone skin, these products are another option for you to try. I’m very happy with my experience and I’ll likely buy more once these bottles run out! You can find Cetaphil DERMACONTROL in most pharmacies across the country. The Foam Wash is 236 mL in size and retails for $18.99 while the Moisturizer SPF 30 is 120 mL in size and retails for $18.99. Connect with Cetaphil Canada on Facebook and Twitter. I too have the oily skin and I’m close to 45. You’re right though I have very few winkles. I think I may give this product a try. Thanks for the honest review. i love this product. it is a tad on the expensive side but worth every penny since it really does the job. I haven’t used Cetaphil since I was in high school, but I really liked it then. nice and gentle. The oil control products would be great for me in the summertime when it’s hot and humid out and I’m wearing makeup! I have been looking for a good lotion for my aging, yet oily, skin. I like Cetaphil products and I use the regular face lotion and it works very good. I did not know that Cetaphil had a oil control lotion to use. How wonderful. Cetaphil is so good because I do not get blemishes from using their products. would love to try the cleanser! 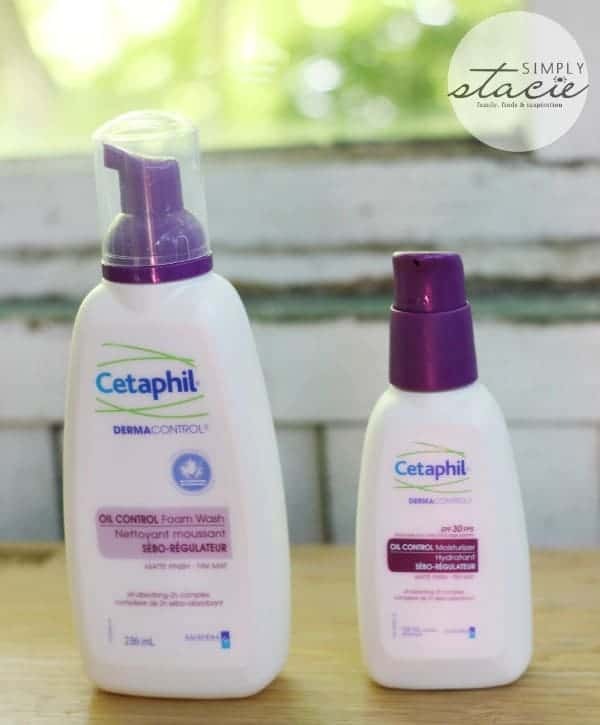 I’m a huge fan of Cetaphil products as are my daughters! Thanks for this review! Thanks for the review, I have never used Cetaphil products but I have heard good things about them. Looks like this is worth trying, great review. I personally love Cetaphil brand stuff and I hear so many dermatologists recommend it. I used to use Cetaphil! Good to know they have kept improving their products and with all the skin issues I am dealing with now, I am really interested in Cetaphil Dermacontrol! Shine control moisturizer sounds amazing! I like having something light on my face, and knowing it’s got sunscreen as well is really appealing. Glad to read it is also in foam. I find the kids waste less and I save money. With our Canadian winters this is an invaluable product. Definitely a must during the winter months!! Looks like I’m going to give this product a try. We used Cetaphil lotion for my son’s eczema when he was younger. It worked well. I bet this would be great too. I have to agree with others…it is a little expensive but sometimes it is worth to pay a little extra for something to work. Great review! I love Cetaphil products 🙂 Will definitely look for this at the store. I never heard of this product but might try it. Thanks for the review! I think I’ll give the cleanser a try! I think Cetaphil is a great product when your skin is feeling irritated and you need something to sooth it. This new DERMACONTROL line of products sounds great, too bad they didn’t have it when I was younger, I had really oily skin. I have not yet tried this product and really want to even more now. I am always looking for a good lotion and cleanser. Thanks for sharing this one. Looks like a great product. I’ve heard nothing but good things about Cetaphil! I’ll have to give this a try, I’ve yet to find a product that actually works for me. This one sounds great! my sister could use this. I bought a bottle of this a few months ago. I absolutely love it! So does my skin! Great product! I love using it in the winter especially when my skin tends to get very dry. when I was on medication for acne, cetaphil was a lifesaver for my super dry skin!